As if it wasn't enough that yesterday we welcomed our first child into the world, today Josh started a new job! He is honored and excited to have accepted a role as a Senior Solution Consultant with Ariba, an SAP company. Ariba has been very understanding about the near-simultaneous timing of these 2 wonderful events and are allowing Josh to ease into the job slowly, which we of course very much appreciate. Thank you for all your prayers and support as we navigated getting ready for Hallie Elizabeth Adams while Josh was seeking a new position--and thank you in advance for your prayers and support as we go forward now into these 2 great new adventures! 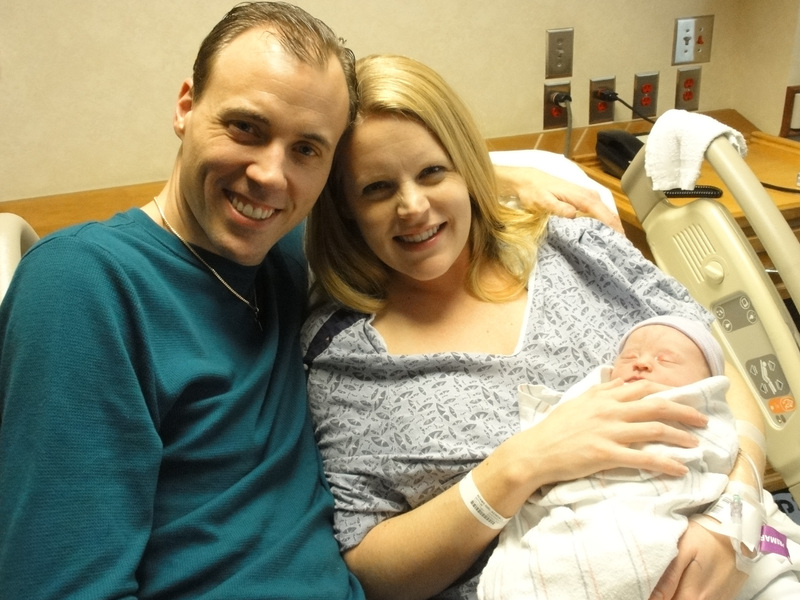 We are pleased to announce that early this afternoon, Kendall delivered our first child! Our daughter Hallie Elizabeth Adams was born into the world at 12:14 PM EST. She is being monitored for some kidney issues we already knew about from prenatal ultrasounds but otherwise is healthy and doing very well, measuring 19.5" and weighing in at a healthy 7 lbs. Last night was a LONG night so we'll keep this short but please know that our family thanks you for all your prayers and support. Recently we posted that we're having a baby. We found out today that our little bundle of joy is a girl! We are pleased to announce that Baby Adams is due on January 19, 2013! :) Kendall's pregnancy has been very smooth so far and that has been a great blessing. We don't yet know if we're having a boy or a girl (but we do expect to know after Kendall's next ultrasound) and of course we'll be ecstatic either way. It's an incredible blessing--and it's going to be a great adventure! WEDDING. The best and most significant day for us was our wedding day, March 26th, 2011 when we committed our lives to one another in the same church that my (Kendall) parent's got married in. Every girl dreams of the 'perfect' wedding day, and as soon as Pastor Bob pronounced us husband and wife, there was an enormous rumbling 'boom 'of thunder and the sky broke loose with pouring rain and flashes of lightening. It continued to pour down rain until we got to our reception and throughout the rest of the evening. I can now proudly say as a rainy day bride that it does not matter if it pours, thunders, and lightenings on your wedding day, it will still be wonderful. Josh and I met in the rain on a gloomy January day and we wouldn't have had our wedding day any other way! TRAVELS. We absolutely love to travel, and both of us share the same adventurous opinion that a long plane flight doesn't matter if you are getting to see someplace cool. We took that to the extreme this year, starting the day after we got married when we took a 14 hour flight to Seoul, South Korea and then another 7 hour flight down to Bali, Indonesia for our honeymoon. It was worth every hour on that plane, and we have fallen in love with Bali and its people. Josh found a villa that we were able to rent from a Dutch man on the north coast called Lovina and we spent our first week there. Our second week was a surprise to me in the nearby island of Nusa Lombongan where cars are a rare sight and people travel by foot, boat, or scooter. It was stunning. We then made a pit stop over to Kuala Lumpur, Malaysia (when you're that far away from home, you might as well explore all you can right?!) for two nights and have found what we both agree to be the best breakfast buffet that we have ever eaten: The Doubletree Kuala Lumpur. Imagine an international schmorgesborg of everything from spicy chicken to dim sum, french pastries to guava juice. I could go on and on...Next up was Ft. Lauderdale, Florida where I tagged along for a Memorial Day weekend work trip (Josh) turned into play trip where we visited my cousin Blair, spent time with my childhood friend Stacey, swam, and rode bikes. Hong Kong was next on the 2011 year of adventure, and this event deserves an entire blog post in itself. I will keep this one brief here for that reason: We were offered two buddy passes from a dear friend of ours to use for the week of July 4th (our company shuts down that week..oh, darn.) We researched flight schedules and found a flight that goes from Detroit to Hong Kong and it was looking like we could get on that flight. As a buddy pass traveler, you are lowest on the totem poll of travelers and can only get on a flight if there is stand by room. Well, we bought two travel guides on Hong Kong, and refused to read them until we knew we were going to get to go. We got on the first leg of the flight from ATL-Detroit, and we were called to board the Hong Kong flight just minutes before the flight left the gate. We started reading those guides vigorously. We landed in Hong Kong 15 hours later and we sat down to book a hotel room in the Hong Kong airport. That's how little we had planned on this trip, and the next 8 days were nothing more than an excursion of a city of which we fell in love with in minutes. We walked our legs off, sweated through our shirts within the first 10 minutes of being outside, welcomed the lack of personal space that this culture offers with every step, won a photo contest with our submission from Victoria Peak, still cannot get over how many malls there are in Hong Kong, and love to talk about this adventure very often with the fond memories that we have from it. On the North American continent, I got to go to Lubbock, Texas for the first time to meet Josh's Granny for her 90th birthday and we spent time with all of our Texas relatives for a long weekend. We spent a week at the beach in Amelia Island with Josh's parents, sister, and her family. It was a fun time to spend with our baby niece and three year old nephew as well. We did not take off work for this so were heavily immersed in our work for much of the day, but cannot complain: Life is better at the beach, even if you do have conference calls to join. We went to California in September for my college roommate's wedding where we basically had a mini-reunion of old college friends. We took that as an opportunity to show Josh some of my favorite parts of Southern California, including the UCLA campus. California highlights include Katie and Pat's wedding, walking around Newport with Jenny and Dan (and getting to spend the night with them at the beautiful Pelican Hotel thanks to Jenny's 5 star job as a Robb Report editor. Travel with Jenny and you travel in style); farmers markets, taking Josh on a running tour of UCLA, my mom coming to visit, Brazillian food, the Rose Bowl, touring ABC studios, visiting my old church, and checking out the new UCLA pool. We finished out the year of travels with Las Vegas, the one work event that we both get invited to: Adobe's Worldwide Sales Conference. Six days in Vegas is plenty, especially if you are stuck in a conference room. The best part about that trip was that we got to be together in a fun place all while doing our jobs. Oh, and did I mention that I made Delta Silver Medallion after all of this? All of this has resulted in our travel blog: http://whattimezonearewein.wordpress.com/. Enjoy! HOME LIFE: We have been slowly settling into our home in Dunwoody, and have had many projects to tackle along the way. It has been a success so far, and we find ourselves realizing more and more each day that life isn't all about how perfectly organized your home is, but it is so much more! As a wife, it's easy to get stuck in the weeds of 'this needs to be straighted out, or that needs to go there' but have enjoyed making so much progress this year in making our home ours. Highlights include our 'Amazing Craigslist Find' of a barely touched couch, two chairs, and decorative lamps from a kind couple in Sugarloaf, creating our home office out of our living room downstairs, our fall garage sale (wow, we live in a good spot for a garage sale), painting, and two cars now able to officially park in our garage. Yippee!! We have tremendously enjoyed working from home together this year. We both work for Adobe (different divisions and roles) and have the privilidge to be able to do our jobs from our home office. Josh has recently taken on a new role within the company and travels within the Southeast a bit more frequently, and I only travel a few times a year. We feel so blessed to have jobs that we enjoy (most of the time=) and that allow us the flexibility that they do. We have been attending Buckhead church since we met, and we are eager to get involved in a Small Group in a couple of weeks. We didn't join one at the August Group Link, and that ended up being a good thing as we have been out of town so much that it would have been difficult to stay involved with it. Depending on where the Newlywed groups meet, we will either stay at Buckhead Church or will move to North Point, and we are excited to get more involved with a community. This year has been a huge blessing, an adventure, and we are thankful for each opportunity that we have been given together. Happy 2012!